So I have a little back story to share with you. I recently discovered that on Tuesdays, The Fresh Market, sells ground chuck and vegetarian fed/antibiotic free chicken breasts for $2.99 a pound. What an AWESOME deal! This was in May, but I know here in Atlanta they are doing it through June as well (and maybe it will continue each month!). So Chickadee and I headed to The Fresh Market to pick up some meat. The ground chuck was easy to configure how much I wanted, but when it got to the chicken I wasn’t sure…thinking about how I usually buy chicken in the meat department at Publix, I decided to tell them I wanted 6 breasts. I asked for them to wrap them individually for freezing purposes. They started to weigh them one by one and each package was over $4.00….I was like whaaaattttt? Come to find out each breast, was a FULL, two pieces, chicken breast. Folks I ended up buying almost $30 worth of chicken :) Thank goodness for the freezer! So…we have been having a lot of chicken in these parts, like this Pretzel Fried Chicken I shared the other day. 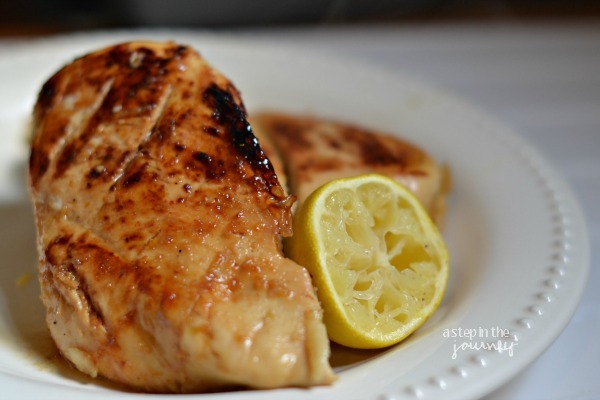 Yesterday, I thawed two more chicken breasts and decided to work with what I had in the pantry and fridge for a simple honey lemon marinade. It actually turned out REALLY great! In a large ziplock bag mix the zest and juice of 2 lemons, 1/2 c. honey, 2 tbsp Worcestershire sauce, 1/2 tsp cumin, 1/2 tsp pepper, 1 tsp salt. 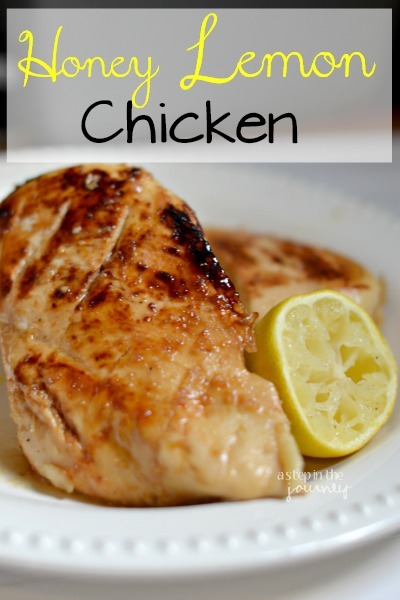 Using a knife cut slits across the top of your chicken to better marinate. Place the chicken in the ziplock bag and shake until chicken is well coated, then place in the fridge for at least 4 hours to marinate. You can either grill or bake the chicken. If you grill make sure the chicken reaches an internal temperature of 160 degrees (this will take 5-8 minutes on each side over medium heat). If you prefer to bake, cook at 350 degrees for 30 minutes. I browned the outside of the meat in a skillet before baking. Optional: Drizzle with additional honey for added sweetness! I think this would be really great with lime in place of the lemon too!